The French writer Christine Arnothy was born in Budapest in 1930, daughter of an Austro-Hungarian father and a German-Polish mother. From her earliest childhood, she was faced with three languages, German, French, and Hungarian. The Francophile atmosphere of the family home was such that by the time she was an adolescent, she had become attached to France; the choice of the French language for her writing, adopted in a symbolic sense as the "mother tongue", was analyzed for the first time in her later autobiographical work Embrasser la vie. During the siege of Budapest (occupied by the Germans and encircled by the Soviet army), she hid with her parents in the basement of their building, and kept a daily journal of this battle for the city, some of whose neighborhoods were reduced to total ruins after two and a half months. Following her clandestine depature from Hungary with her parents, Christine Arnothy took refuge in Belgium. In 1954, she won, for her war journal, an important literary prize, le Grand Prix Vérité ("The Grand Prize for Truth"), sponsored by a French daily, Le Parisien libéré,, thus making a most distinguished entrance into the world of French letters. Her story was published in Paris in 1955 in book form, with the title J'ai quinze ans et je ne veux pas mourir (English translation, GB : I am Fifteen and I do not Want to Die ; USA : I am Fifteen and I do not Want to Die). Within the space of just a few months, the book had become a worldwide success. 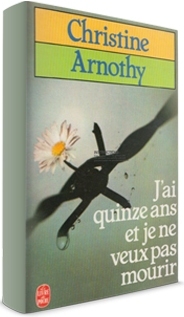 A second autobiographical text, which Christine Arnothy calls the "little" sequel, titled Il n'est pas si facile de vivre (English translation : It is Not so Easy to Live ), was published in 1957 by Les Editions Fayard. Both books were soon famous the world over. The two titles were published in one bound volume in 1964 by Fayard and appeared in 1959 in paperback in Le Livre de Poche and have sold to date - to quote only the figures for France - over three million copies. This journal has become a classic, is reprinted regularly, and is often recommended reading for high school students. J?ai quinze ans et je ne veux pas mourir.? has been published in over twenty-five countries to date. While continuing her international career as a writer, Christine Arnothy married, in 1964, the director of the daily newpaper Le Parisien libéré, Claude Bellanger. Since the death of her husband (in May 1978), Christine Arnothy has divided her time between Paris and Geneva. The son she had with Claude Bellanger, François Bellanger, following in the footsteps of his ancestors from Lille - all judges - is a lawyer specialized in European rights and professeur of administrative law at the University of Geneva. Claude Bellanger's Press Collection, consisting of approximately 80 000 documents (ranging from a first copy of a Renaudot Prize - winning novel to some very rare copies of clandestine press), was transported to Switzerland as it was not possible to house it in the French National Library. It has become the Claude Bellanger collection in Martigny (in the Valais region). François Bellanger is the administrator of this collection, which acquires new elements from time to time. On September 15, 1989, the President of the French Republic, François Mitterrand, made a private visite to Christine Arnothy in Martigny. On the same trip, he inaugurated the first exhibition of the Bellanger Foundation, and pronounced a vibrant hommage to Claude Bellanger, outstanding journalist, Resistance fighter from the earliest days of the war, Vice President of the Agence France-Presse, and President of the International Federation of Newpaper Editors. Journalism : From 1966 to 2004, Christine Arnothy worked as a literary journalist for the Parisien. From 1982 to 1994, Christine Arnothy wrote weekly articles for the newspaper La Suisse, along with political interviews. Several conversations with President François Mitterrand were published both in Le Parisienand inLa Suisse. Occasional articles : Christine Arnothy has also contributed articles to L'Aurore, Paris-Presse, L'Echo de la mode, Le Courrier de l'Ouest, Preuves-Informations, Combat, Pariscope; from September 1972 to May 1973, she wrote once a month for the column "Face à notre temps" ("Face to Face with our Times") in the Journal du Dimanche (in alternance with L. Leprince-Ringuet, Alain Decaux and Robert Sabatier); from June 1973 to August 1974 she published texts in Lectures pour tous, etc. "Les conditions de l'écriture" ("Conditions for Writing"), by Ch. 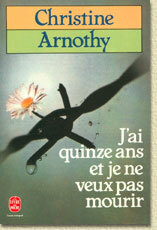 Arnothy, La Table Ronde, March 1956. "L'écriture et la vie" ("Writing and Life"), by Ch. Arnothy in Arena, January 1962. "Le roman par les romanciers" ("The Novel, by Novelists"), answer to a survey in the review Europe,Octobre 1968. "Entretiens avec Christine Arnothy" ("Conversations with Christine Arnothy"), in Men, October 1968. 36 écrivains? et leurs 4 vérités ("36 Writers? and their Home Truths"), by André Halimi, Hachette, 1969. "Tant de promesses tenues" ("So many promises kept"), in the catalogue Peintres témoins de leurtemps ("Painters Witness to their Times") on the theme of "The Dream", 1970. "Comment écrivent les femmes" ("How Women Write"), by Agnès Lamoureux, in La Revue des deux mondes 15, april 1963. Les dames du temps présent ("Women of Today"), by Léon Zitrone, Solar, 1967. Pariser Coctkail, with a preface by André Maurois, Wien-Hamburg, 1963. Une anthologie vivante de la littérature d'aujourd'hui by Pierre de Boisdeffre ("A Living Anthology of Today's Literature"). Previously unpublished text with a note on Christine Arnothy, Librairie académique Perrin, 1965. Contribution à une dramaturgie de la télévision ("Contribution to a dramatury of television"), Direction of Television, Service of Dramatic Programming, National French Television Center, 1969. "Pourquoi la France ?" ("Why France?") for the Figaro Lectures, salle Gaveau, Paris, February 28, 1975. "Les coulisses de la création " ("Behind the Scenes of Creativity"), Alliance Française of Bern, December 17, 1984. "L'adolescence de l'Histoire" ( "The Adolescence of History"), Basel, April 29, l985. "Les coulisses de la création" ("Behind the Scenes of Creativity"), Hôtel Majestic, Montreux, April 19, 1989. "L'Histoire à bout de souffle?" ("History is Running out of Breath? "), Swiss Section of the LICRA, Maison du Grütli, Geneva, Septembre 22, 1992. "Les secrets de la création littéraire ("The Secrets of Literary Creation"), Alliance Française of Bern. "Le roman d'un roman" ("The Novel of a Novel"), French Circle of Geneva, February 17, 2000. "Les villes-vedettes de mes romans : Sydney, San Francisco, Nairobi et Vienne" ("The Cities at the Center of My Novels : Sydney, San Francisco, Nairobi and Vienna"), Alliance française of Fribourg, March 27, 2003. The most important events and surprising moments in her life, from her departure from Hungary to her arrival on the international literary scene, have been recounted by Christine Arnothy in her book Embrasser la vie ("Embracing Life").